Your mirror is missing or broken and you need to fit a new one. We're going to fit the new mirror, then fix it in the right position. This page covers fitting a mirror in to the door. 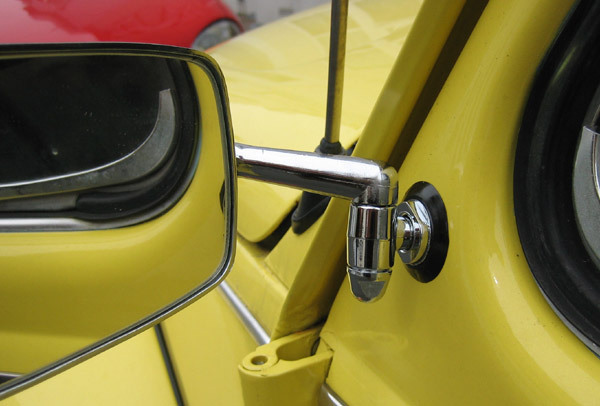 Your Beetle may have mirrors which screw down in to the tops of the hinges. If that's the case you'll have to either find another guide, or just read this one, see how easy it is, and apply it to your mirrors. Locate the hole which the mirror screws in to. In the pictures I'm on the left-hand side door - the passenger side for me as mine is a UK car. If your mirror is broken, wrap some rag around it to protect your hands (wear decent gloves as well if you have them) and unscrew it from the car. 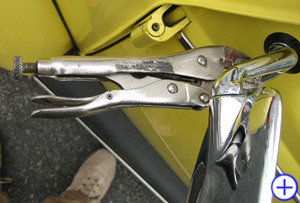 If you can't shift it, see if you are able to fit a large spanner around the stub of the mirror housing coming out of the car - you may be able to use the spanner to unscrew it. If this is the case, use a bit of rag as a barrier between the spanner and car in case you accidently scrape your Volkswagen's paintwork. Line the mirror up with the hole and make sure you've got the basics right - like it's the correct mirror for that side of the car! 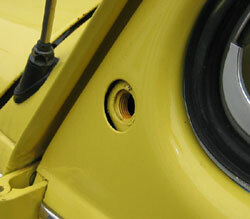 Make sure the washer is on the screw before you start fitting it. 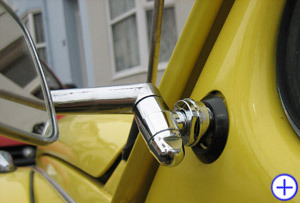 Put a drop of oil on the screw before you start screwing the mirror in to the door, it'll help it get seated in properly. It doesn't take much work, just screw it down until it won't turn any more, then back until the mirror is sitting right laterally - in line with the road. 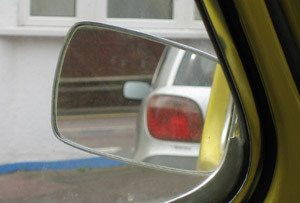 Once the mirror is in place, stand behind it and fiddle until it is roughly in the right place for the driver to see behind them. Sit in the car and keep adjusting the mirror until you can see behind properly. The bottom of the mirror has a bolt that can be adjusted to hold the angle that the mirror is set to. In the picture you can see I'm using some mole grips to turn the bolt, and I'm using a scrap of cardboard to protect the chrome of the mirror housing. It would be better to use an adjustable spanner to do this, but I couldn't find mine. Try to leave it loose enough that you can still adjust it by hand, just in case you need to do some refinements after you've used it for a while. You're mainly trying to make sure the wind at top speed isn't going to fold it backwards, and that a light knock from a passerby won't throw it out. 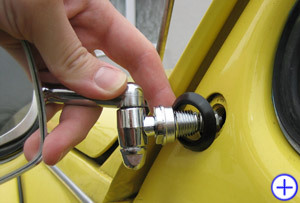 Below is another angle on how to adjust the mirror to hold it's angle. 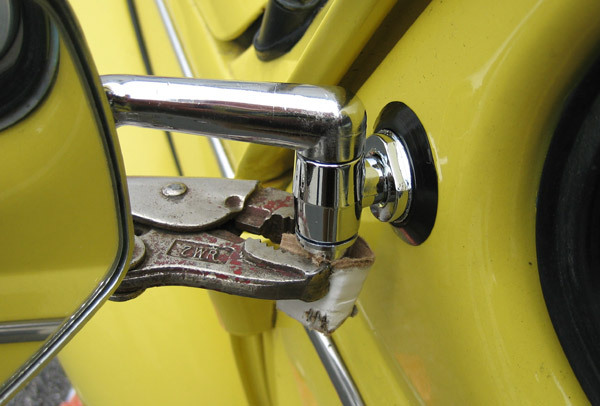 Hold the mirror firmly while you're turning the grips or spanner slowly, you don't want the mirror to move or you'll have to adjust it all over again. Once you're finished, the driver should be able to see down that side of the car (which will hopefully help their parking) and the mirror should hold it's position while the car is at top speed.